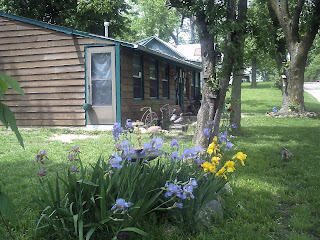 My little corner in a small town sits on 4th and benedict street Seneca Kansas .A family home stead built by Damien AKA (JIGGS) McAuliffe in the 70’s " Vernon " JIGGS and Darlene;s son. Whom I married in 1981 ,in this very house. We Bought the house in 1996 from his mom Darlene she had decided she wanted to move to Holton to be closer to her Family .Vern and I remolded added front porch .and have been very happy ever since. The house will be hopping this weekend for it will be filled with laughter Vern’s side is having a family reunion Verns brother is coming in from Missouri will be staying with us he will be bring his grown family and their kids,we have not seen in 5 years it will be good to see them. It is time to put the turkey’s in the oven I will be making home made noodles and turkey for the reunion YUM YUM.